This artist's impression is based on the first ever map of the weather on the surface of the nearest brown dwarf to Earth. An international team has used ESO's Very Large Telescope to make a chart of the dark and light features on WISE J104915.57-531906.1B, which is informally known as Luhman 16B and is one of two recently discovered brown dwarfs forming a pair only six light-years from the Sun. Note that the faint fine detail on the surface has been added for artistic effect. Image released Jan. 29, 2014. 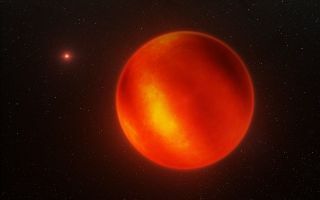 Scientists have created the first weather map of a space oddity known as a brown dwarf, revealing a rare glimpse at alien weather patterns on the failed, wannabe star. The map shows the weather on the surface of WISE J104915.57-531906.1B (called Luhman 16B for short), the nearest brown dwarf to Earth at 6.5 light-years away. Scientists mapped the light and dark features of the failed star's surface, according to officials with the European Southern Observatory, whose Very Large Telescope in Chile contributed to the new science. You can take video tour of the brown dwarf and its weather map on SPACE.com. "Previous observations have inferred that brown dwarfs have mottled surfaces, but now we can start to directly map them," the new study's lead author, Ian Crossfield of the Max Planck Institute for Astronomy, said in a statement. "What we see is presumably patchy cloud cover, somewhat like we see on Jupiter." Crossfield and his team found that Luhman 16B probably harbors gaseous clouds made of iron and other minerals in a mostly hydrogen atmosphere. The brown dwarf rotates fully about every four hours. Weather on the brown dwarf would not be favorable for humans, however. Temperatures soar to about 2,000 degrees Fahrenheit (1,100 degrees Celsius), Max Planck officials said. Luhman 16B is one in a pair of brown dwarfs in the southern constellation of Vela, the sail. Its brighter counterpart is known as Luhman 16A. In another study, scientists were able to dissect what is happening in different atmospheric layers on both Luhman 16B and Luhman 16A. The two brown dwarfs were first discovered in 2013 using data from NASA's WISE space telescope, which maps the sky in infrared light. Scientists used Doppler imaging to create the Luhman 16B weather map, which somewhat resembles satellite weather views of Earth, Max Planck officials wrote in a news release. ESO's Very Large Telescope has been used to create the first ever map of the weather on the surface of the nearest brown dwarf to Earth. An international team has made a chart of the dark and light features on WISE J104915.57-531906.1B, which is informally known as Luhman 16B and is one of two recently discovered brown dwarfs forming a pair only six light-years from the Sun. "In the future, we will be able to watch cloud patterns form, evolve and dissipate — eventually, maybe exo-meteorologists will be able to predict whether a visitor to Luhman 16B can expect clear or cloudy skies," Crossfield said in a statement. By examining weather on brown dwarfs, scientists might be able to better understand how the atmospheres of giant planets outside of the solar system work, researchers have said. "We've learned that the weather patterns on these brown dwarfs are quite complex," Beth Biller, leader of the second study detailing the atmospheric layers, said in a statement. "The cloud structure of the brown dwarf varies quite strongly as a function of atmospheric depth and cannot be explained with a single layer of clouds." ESO's Very Large Telescope has been used to create the first ever map of the weather on the surface of the nearest brown dwarf to Earth. An international team has made a chart of the dark and light features on WISE J104915.57-531906.1B, which is informally known as Luhman 16B and is one of two recently discovered brown dwarfs forming a pair only six light-years from the Sun. The figure shows the object at six equally spaced times as it rotates once on its axis. Image released Jan. 29, 2014. The brown dwarf surface-mapping results appear in the journal Nature, and the atmospheric layer results are in Astrophysical Journal Letters.